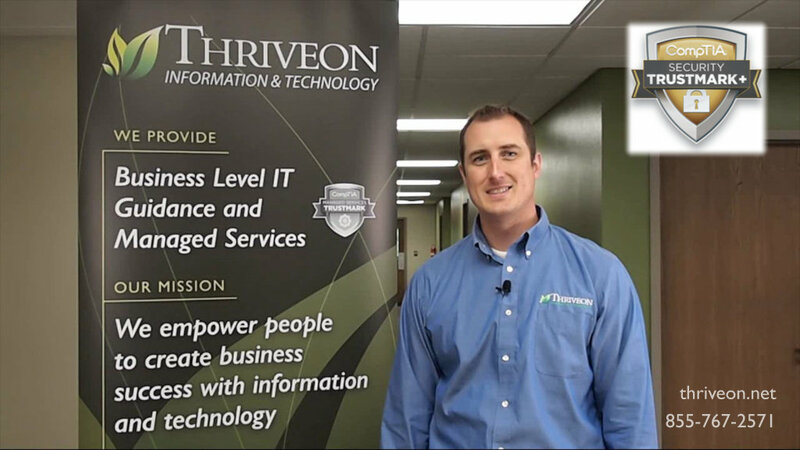 New Ulm, MN – May 22, 2017 Thriveon announced today it has received the Security Trustmark+ from CompTIA, the global non-profit association for the information technology (IT) industry. The CompTIA Security Trustmark+ validates that Thriveon uses the security processes identified by the IT industry as generally accepted best practices and has been evaluated by an independent third-party assessor as meeting the criteria established by the CompTIA Security Trustmark+. Based on the National Institute of Standards and Technology (NIST) Cybersecurity Framework, the CompTIA Security Trustmark+ is a comprehensive review of the security posture of any IT business, applicable across multiple industries and compliance regulations. Along with the CompTIA Security Trustmark+TM credential, Thriveon also announced that it has begun to offer clients Cybersecurity Awareness Training for their employees. As seen in last week’s record breaking ransomware attack, known as “WannaCry”, it just takes one click in a malicious email to give hackers the access they need to take control of data and networks, shutting down business operations and potentially putting lives at risk. Cybersecurity is just one of the seven facets of IT strategy and management that we provide our clients. To explore how your company can get better IT results that bring more value to your business, please contact us at 855-767-2571. Our clients come to us because they want better IT results that will grow business value. We provide them with an entire IT department for a fixed monthly fee, and a proven path to business success through our proprietary Information Technology Strategy (ITS)™ model. Our approach allows us to create and implement IT strategy according to each client’s unique business needs for best return on IT investment today and in the future for companies with 20 – 500 computers. Founded in 2002 and family owned, Thriveon’s mission is to be the most helpful information and technology firm with a focus on empowering people to create business. The CompTIA Security Trustmark+ is a vendor neutral, business-level credential, designed to qualify and differentiate organizations that provide exceptional data and network protection services. This designation identifies IT services companies that demonstrate a commitment to industry recognized security standards and adhere to prescribed compliance measures. Each CompTIA Security Trustmark+ holder organization has undergone an extensive practice review, including an examination of its methodologies and management policies with a third-party auditor. This process authenticates a service provider’s ability to prevent data breaches and IT security intrusions in their clients’ networks and systems, as well as their own business.